We’ve been getting some hard ground frosts recently although the weather has become very mild again over the last 24 hours. Nevertheless winter is here and the frosts have done their cruel work. Stuff has stopped growing and stuff has been cut down by the cold. The white flies in the polytunnel, having gorged on everything earlier in the season, are probably in hiding and planning their assault next summer. I’ll have to get serious! I’ve joined a gym again. The last time I was a member, seven years ago, coincided with my heart attack and it helped me to recuperate. It was a relaxing, annonymous, comfortable area where I could read and write. I’ve rejoined for those same reasons plus I want to improve my core and upper body strength to run better. I expected instant results and I got it, knocking 2 seconds off my previous week’s time at parkrun. This was after a couple of sessions. 2 seconds is not to be sneezed at. If I were to maintain that level of improvement consistently, another 35 parkruns would lead to a new personal best. I shall persevere. The gym has got a Woodway which is a self propelling treadmill. You run on a concave surface so there’s a degree of gradient. It’s quite different to a conventional treadmill and I didn’t find it easy. Today I couldn’t do more than 5 minutes although I probably ran too fast. I don’t always enjoy running but I do feel a great deal better from doing it. It’s the same with an hour in the gym. I don’t follow a particular routine and I don’t have a plan. But whatever I do, I feel healthier and fitter and I have a better quality tiredness. People don’t know what they are missing. A local angling club donated about 20 silver birch saplings which I dug up and replanted just ahead of the frosts. A reminder of late summer. This entry was posted in Exercise and heart disease, gardening, Gardening as therapy, gardening therapy, parkrun, Running, running races, running with heart disease, Uncategorized and tagged Cambridge parkrun, exercise, gardening, healthy living, heart disorder, parkrun, running. Bookmark the permalink. 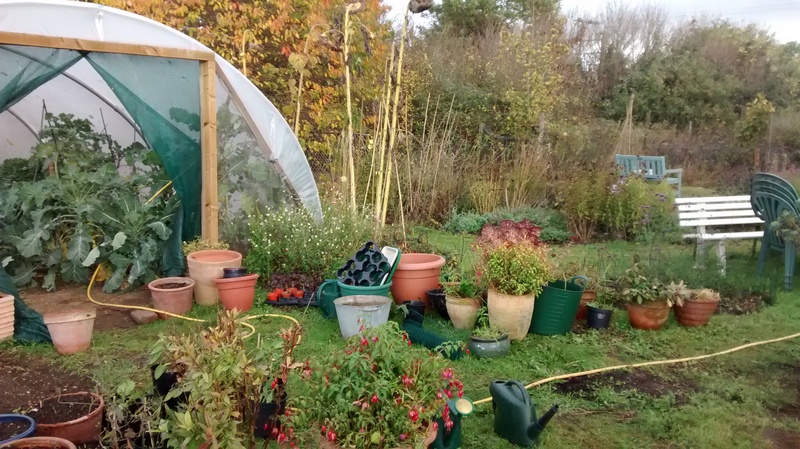 Despite the frost the green minds project is looking good! I’m sure that the whitefly will struggle as much as the plants to survive. Do you get a lot of participants for the project? Interested in the gym as a space to write. Is Cambridge not full of inspiring libraries? Are they exclusive members only clubs? Are there too many irresistible books to distract you? Ta! The project is GP referral only. About 15 GPs in the surrounding area, one GP has referred 2 and another GP has referred 9.Only 1 person has taken it up. Various reasons for this state of affairs and I will persist for another year. Cambridge has got some great libraries which I don’t have access to. Excellent central library but too far away and no gym attached. The gym I’ve rejoined is pleasingly large and people sit around doing work on laptops. I find it conducive to thinking and relaxing and as I’m an introvert it suits.